June park: Watson Mill Bridge State Park. This was the first month that I was a little bit challenged when it came to working our monthly state park visit into our schedule. And that’s why I’m so glad we have this plan! Because if I didn’t have this plan to stick to (according to me) then we probably wouldn’t have gone to Watson Mill Bridge State Park — and that would mean missing out on such a wonderful state park! I am so, so happy we did this one! It was really amazing, right up our alley, and a great one to visit in the warm summer months! We headed out to this state park after my nephew’s 4th birthday party that morning. My sister’s family lives about 40 minutes from this park (in Athens), so that wasn’t bad at all! We also stopped back by her house on the way home and had dinner with them to break it up — which was great for us. But this state park is worth the visit, no matter where you live. I know you’re going to think I’m weird, but I honestly did not realize until we were there, that Watson Mill Bridge was still a working covered bridge that you actually drove through. Ha! It was amazing!! So very, very neat. It’s the longest wooden covered bridge in Georgia (229 feet) and was just very impressive. So beautiful! We arrived in the afternoon (maybe around 2:30 p.m.) and found parking right away. We put the kids in their suits (I just did it in the car) and walked to the water, which was right next to the lot. Several families were having picnics, and there were quite a few families in the water, but I wouldn’t call it “crowded” or anything. I just thought it was great so many people were out there enjoying it! And it was so great! The only warning I would give, is that the rocks were super slippery if you weren’t on the ones that had moss. The mossy ones were good. The others were so slick, it was scary! I was scared to hold Alice, in case I fell! But once we got that figured out, and found a good place to “set up” we were good. 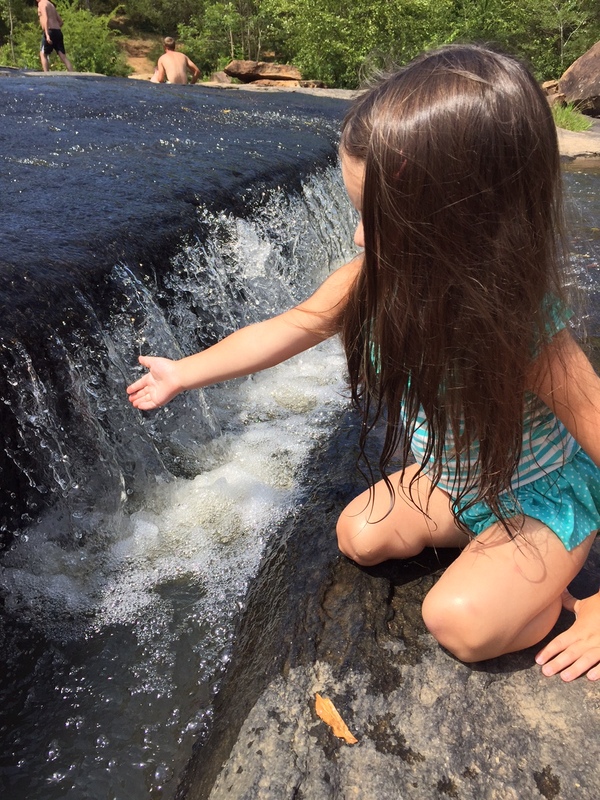 Alice found a little waterfall she loved. Tom found a “deep” pool to swim in. 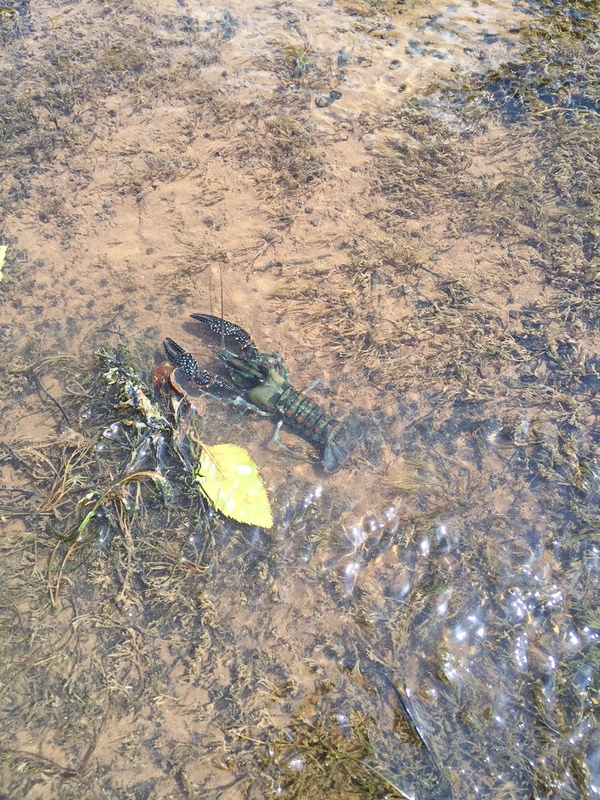 I found a crayfish that I didn’t realize *was* a crayfish, and was really scared of. And Kevin found an old high school buddy to catch up with. It was great. I loved that you could walk right up to the “waterfall” at the bridge. And I loved that there was so much to see. The kids just adored it. After we’d been there about 90 minutes, it started to get really windy and the thunder sounded close — so we decided to head back out. But I KNOW this is one we will visit again this year. It was just really, really great. This one is ranked high for me. 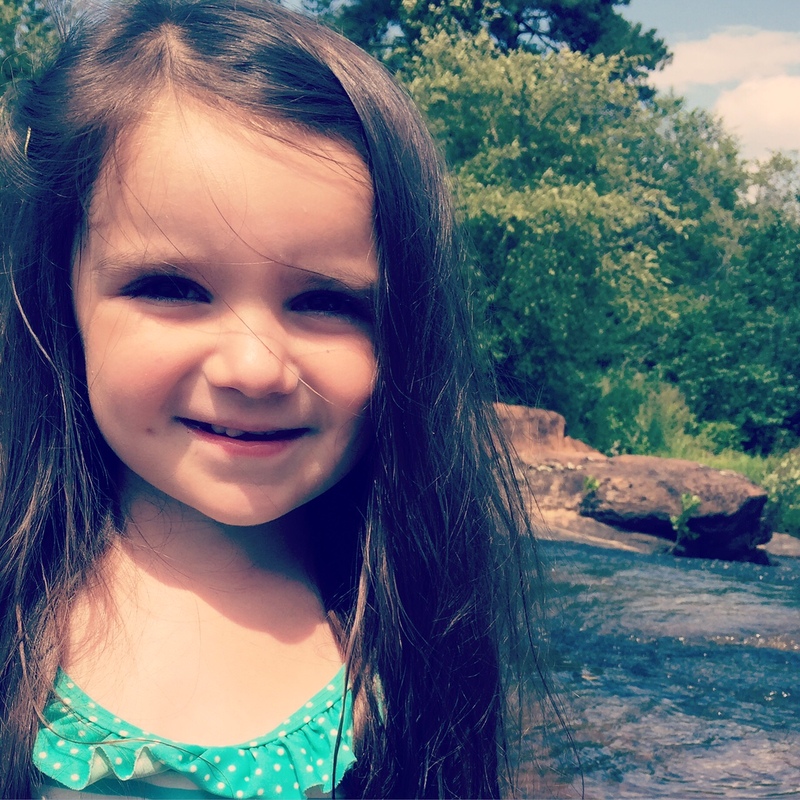 I loved the activity of swimming and exploring the rocks. It was the perfect thing to do on a summer day, with the most beautiful backdrop. LOVED! 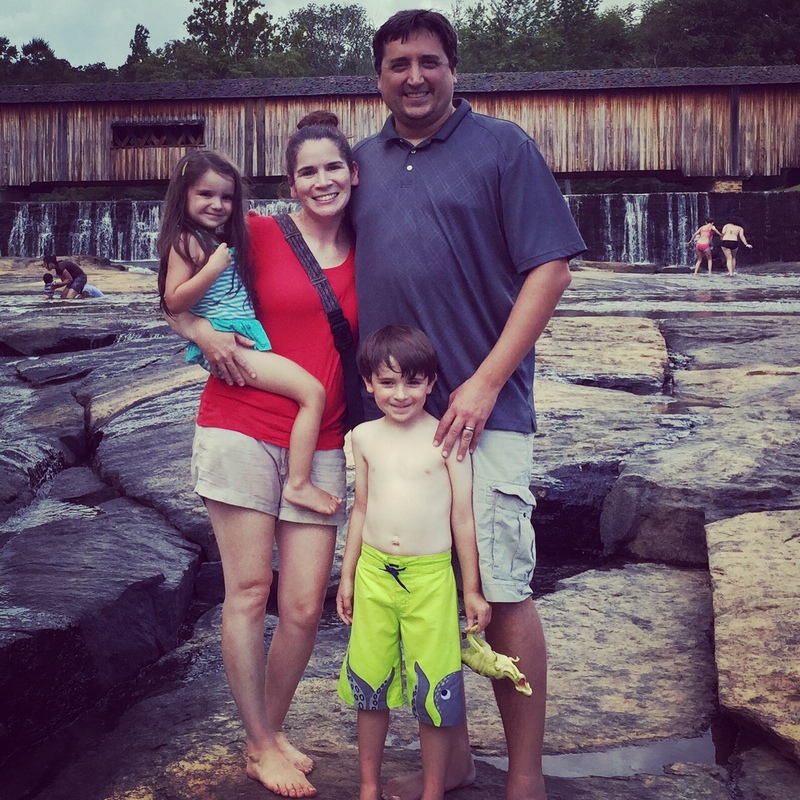 This entry was posted in Alice, Family, Georgia Outdoors, Georgia State Parks, Kevin, Motherhood, Tom, Travel and tagged georgia hikes with kids, Georgia State Park, georgia state parks, watson mill bridge state park. Bookmark the permalink. 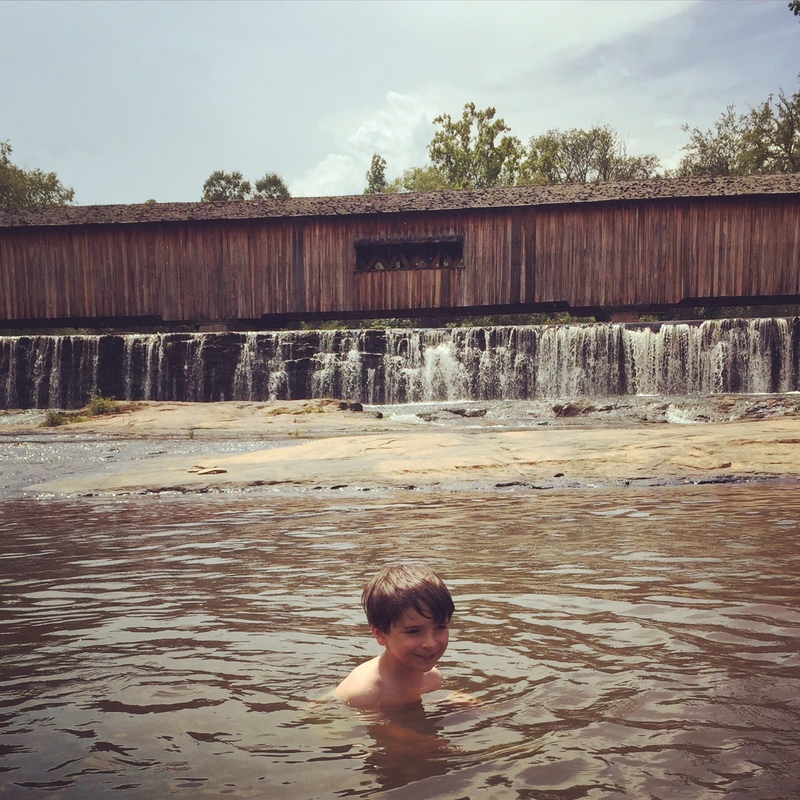 4 Responses to Georgia State Parks: Watson Mill Bridge State Park. Looks like such fun! 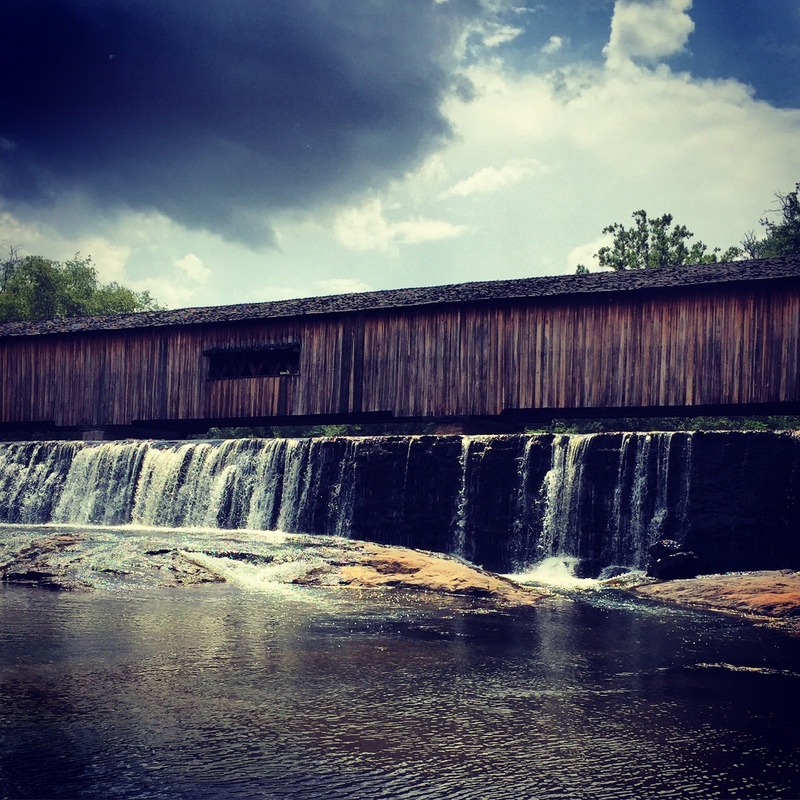 Love covered bridges! Great pics as usual – Alice’s hair looks so long!! Amazing pictures. Love these posts about the parks!